As the name implies, the Carnival Silver Screen is a screened cable, something unusual among loudspeaker wires. The usual thinking is that at the high voltage and current levels associated with loudspeaker connections, a few microvolts of hum or other interference is just not an issue, but radio-frequency (RF) interference can still be conducted back into the amplifier on unscreened cable and, once there, can get into places where it may produce audible effects. The screen on the Carnival is not electrically connected to the conductors, which makes its effects particularly hard to envisage, but we certainly can't think of any reason why it might do any harm. The conductors are 2.5mm2 copper, insulated with polythene and jacketed overall with PVC before the screen is applied, making an overall construction that's rather bulky (13mm diameter) but not too tricky to handle. 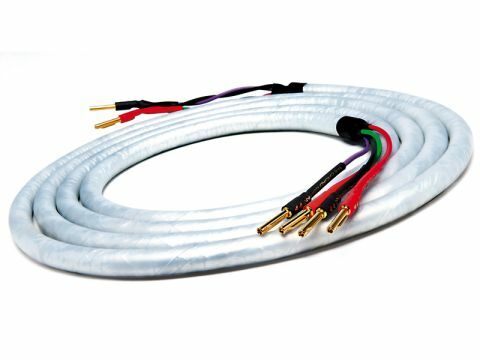 Without an unscreened version for comparison it's impossible to ascribe sonic qualities to physical characteristics, but we found this a very detailed cable that's particularly informative in the upper midrange and treble. It has a lovely sparkle to it and is particularly good at reproducing well-recorded, treble-rich instruments like violin and trumpet. The attack on notes is crisp and well-defined, while the decay into ambience is natural, with none of the sudden cutoff that one sometimes hears. The bass isn't quite the equal of the higher frequencies, though. It has quite good extension but we were never entirely convinced that it was as taut and rhythmic as we'd heard from some other cables around this price.